Adds value to your projects. The Chamfer with Drip Edge is an important part of the Victory Bear chamfer system. 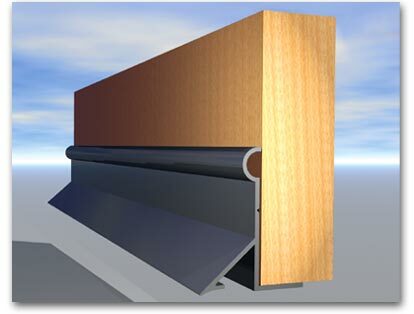 This nonstick PVC form provides a smooth and straight chamfer and drip edge for doors, windows, dock doors and archways. The drip edge is detachable for custom placement. You will save time and labor costs with more attractive results — every time. PVC virtually eliminates concrete pitting caused by wood-wicking. It also eliminates discoloration caused by wood sugars. It almost entirely eliminates the need for grinding and patching, saving you man-hours or subcontractor expenses. Victory Bear chamfers are made with PVC, an ideal material because it cleans up so easily. Reusable – PVC is reusable, making your investment pay off many times. With Victory Bear there are no finish blemishes from screw heads or excess glue. All screws and glue remnants are hidden under the surface for a sharp, glass-like finish. The use of PVC eliminates pock marks, rough edges and imperfections caused by wood. Eliminates discoloring of concrete due to wood sugars. Our patented Flexible Edge Seal fits tightly against the casting surface, preventing concrete seepage while creating sharp, crisp lines. Easy Installation – Form both the chamfer and the drip edge in one easy operation.